An increasing number of attacks take advantage of the capabilities of modern document formats to get past baseline anti-malware solutions. Such evasive measures involve initiating malicious actions from specific files to infect endpoints by using macros, PowerShell and other scripts. A single click can inadvertently infect your systems. Disabling these advanced document features will lead to increased security, however, it is impractical as it will disrupt business operations and affect employees’ ability to perform day-to-day tasks. 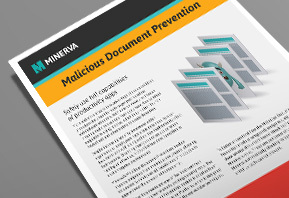 Minerva’s Malicious Document Prevention protects endpoints from sophisticated attacks that hide within legitimate files that evade your other defenses. Employees can now safely use macros without the concern of human error. Empower employees to safely use macros for optimal business operations. Block evasive malware that cloaks itself in legitimate documents. Dramatically decrease the security risk of human errors related to malicious documents. 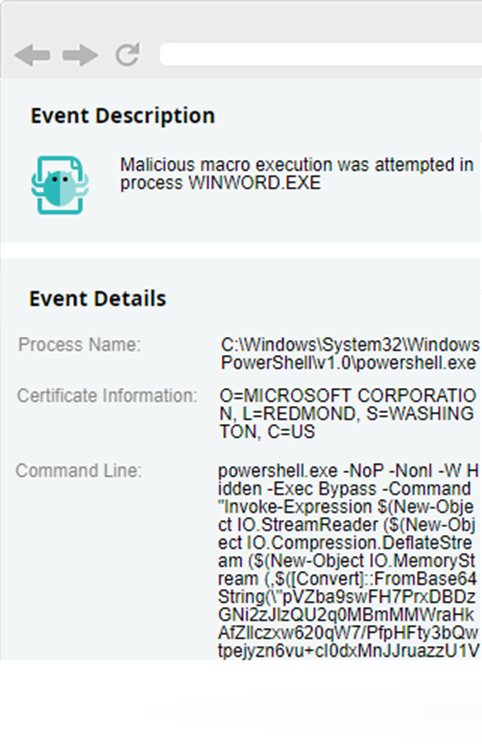 Minerva’s Malicious Document Prevention blocks attempts to infect endpoints via macros, PowerShell and other scripts found in document files, assuring your employees' productivity remains intact. By deceiving the malware regarding its ability to run scripts using these advanced document capabilities, enterprises can fully take advantage of productivity suites such as Microsoft Office without being concerned about disruption to operations and employees’ ability to successfully perform their daily business tasks.